Alumnus of MSU Baroda, Sumit Roy's practice is firmly rooted in the mural tradition of the art school and its concerns with the local context. Yet, he reinvents this inherited aesthetic on his canvases in a language that is boldly inspired by global, mainstream popular culture. He speaks for a generation of urban cultural practitioners who grew up in the face of globalization and corporatization. The media landscape in India changed dramatically with the opening up of the economy, and the emergence of Star TV, and MTV, who in the early years appropriated entertainment from American media for an Indian audience. Confronting the reality of an industrialized nation while occupying the Indian context, Sumit Roy juxtaposes an aspirational visual universe and the cult of global stardom with quotidian sights and attitudes from his immediate locale. 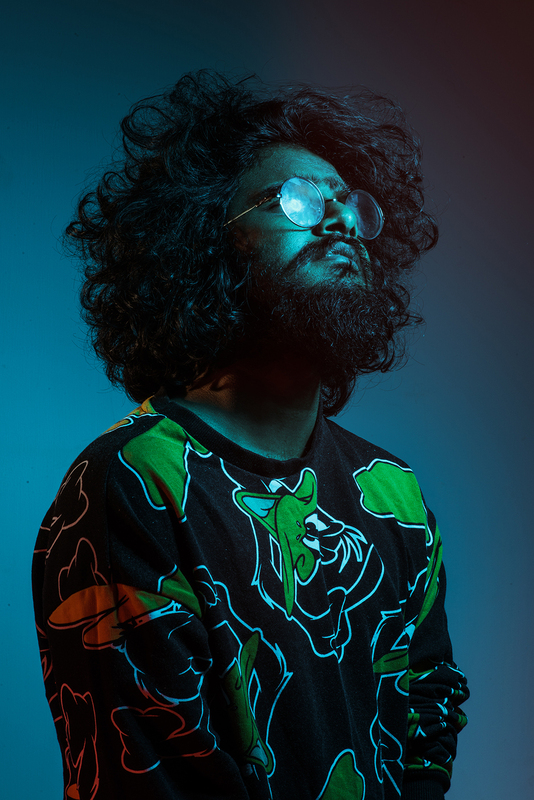 The same approach extends to his music, where he uses the subversive, trans-continental form of hip hop to articulate ongoing contemporary political anxieties in India. As an artist working with sound, text and image, he is able to tap into a range of sensibilities while defying them all. 2018. LATITUDE 28. INDIA ART FAIR. 2018. LATITUDE 28. HOMEGROWN STREET.